The Forehead is part of the Arabian megaconstellation of the Lion (al-asad). On a lion, it marks the hairline of its mane at the top of its forehead. The Forehead (al-jabha) as it appears in the west about 45 minutes before sunrise in early January. Sky simulations made with Stellarium. A grouping of four bright stars, each pair of which is equidistant. 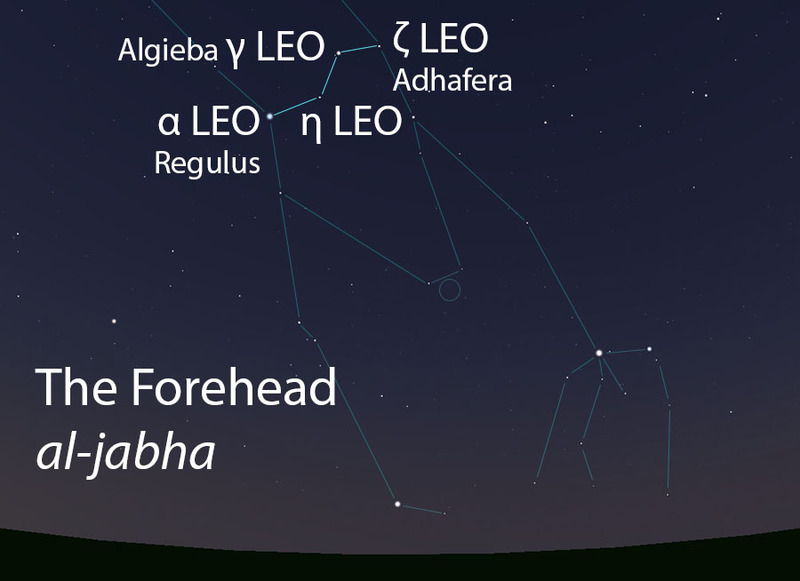 In the calendars of Qushayr and Qays, the morning setting of the first two stars of the Forehead marks the end of the cold winter season called ash-shita’, and the second two stars mark the onset of the warm spring rains (ad-dafa’i). 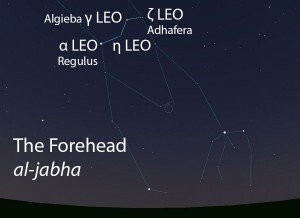 In early listings of the lunar stations, the Forehead is the 12th station of the year. This was later changed to the tenth lunar station after the stations were adjusted to begin with the vernal equinox. The Forehead is part of the Lion (al-asad, الأسد) folkloric celestial complex, which extends from the Two Forearms (adh-dhira’an, الذراعان) to the Two Shanks (as-saqan, الساقان).